I rarely buy "basic" pieces because I have learned that when I do, they tend to sit in my closet, lonely and unused. Pants with side flaps, sweaters with big collars and bell sleeves, long fleecy camel coats, that look great over most things. These are the special pieces I will wear over and over again. This entry was posted on Monday, January 13, 2014 and is filed under black,camel,grey,Mango,white. You can follow any responses to this entry through the RSS 2.0. You can leave a response. I am in love with your coat... BIG TIME!! OH MY FREAKING GOD! This outfit, these pictures: Sooooo beautiful! I love this! Been following your blog for about a year; this is the first time I've left a comment. Totally LOVE your style! Have yet to see you post something that I don't covet or try out myself! Wow, just....wow. Those shapes are fantastic!! The details of these pants are so unique...I can see why you fell in love with them!! I'm definitely more of a fan of the "different" over the "basic," too!! 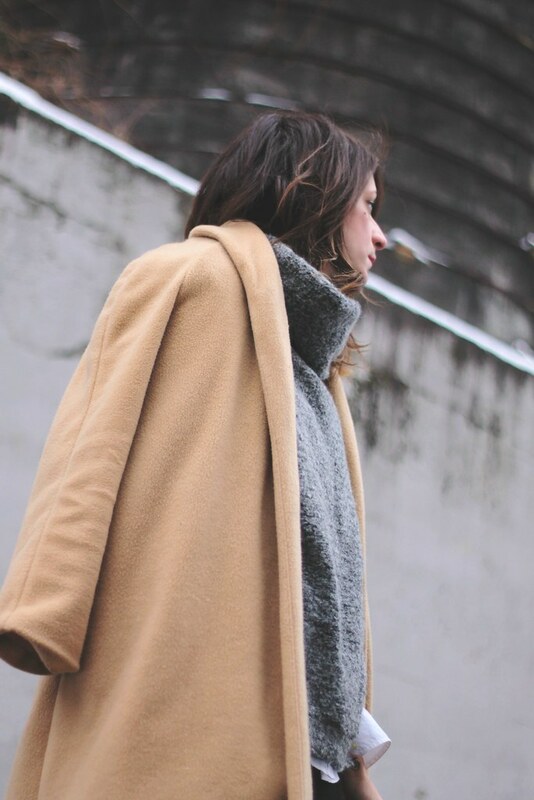 And your grey, funnel-neck sweater looks the epitome of cozy!! Amazing blog! i totally adore this look!!!! <3 glad I found you! Oversize full, I love it. Sounds like a very brave and very sensible proposal. The sweater is beautiful, and the pants have a spectacular design. You look fantastic. So true! I always look for "classics" with special details - cut, shape, texture, embellishment. It just makes them more special. Love every piece in today's photos! Absolutely love this outfit! You have incredible style! These photos should be in a magazine, you look amazing! See you on the next Funday Monday!